This is a three-part blog post. The first part if the hardest part: test results. The middle part is shopping at Goodwill today. The last part is things I pulled out of the attic. None of it ties together, but that’s all right because I warned you first. That doesn’t make me a great writer, just good at forewarning the reader. I saw the doctor on Wednesday of last week. The results of the test were pretty much what I knew they would be, because it is the answer I’ve been getting for over two years. Why should it change now? It is actually very good news which, I suppose, stretched, could tie this blog post to the third point: hope. I’m not going to die of the gross hematuria. What causes it will remain a mystery, but I have – in the words of this doctor – explored every possible avenue to locate the source of the problem. She theorizes (as did my last specialist) that there is a capillary or small blood vessel that is between my kidneys & my bladder and which is broken and unable to heal itself. It pumps blood into my bladder, but not so much as to cause me to be anemic or ill. It just looks ugly and scares everyone. The alternative to that theory is that this is the very beginning stages of something else, but we’ll just monitor my blood counts every six months and see if anything changes. Chances are, it will just go away. I’m banking on that. In other words: I am healthy, I am not a hypochondriac, and we can put to rest any fears of bladder cancer or bizarre autoimmune disease. It has been over two years and cost us thousands of dollars, but I have a clean bill of health (so to speak). 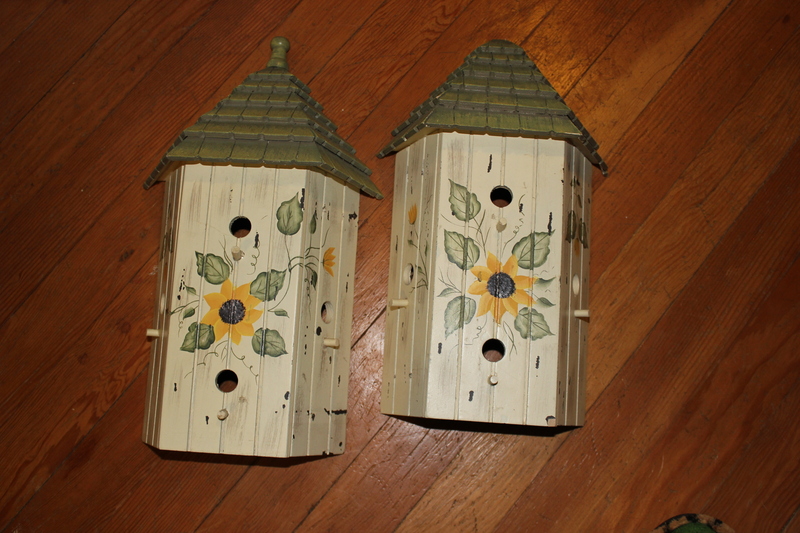 Partly in celebration of this diagnosis (or lack thereof), I decided to spend some money at Goodwill. I love thrift stores. 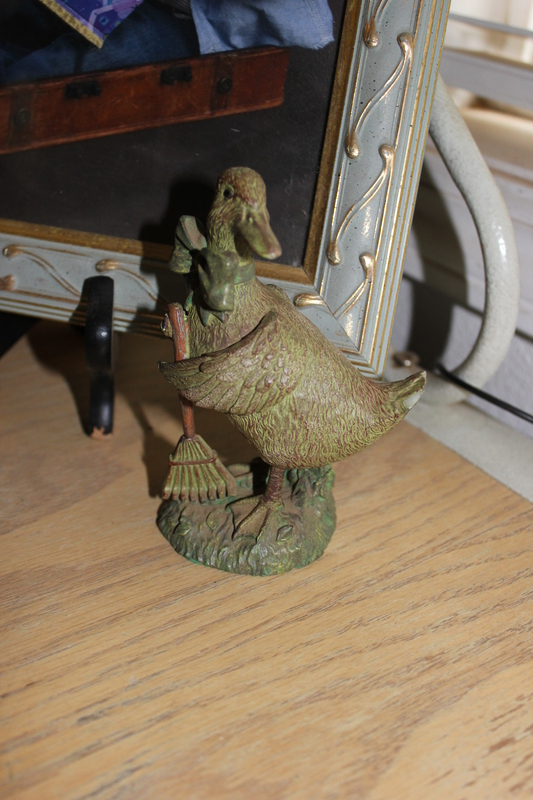 A charming 4″ tall duck with a rake. 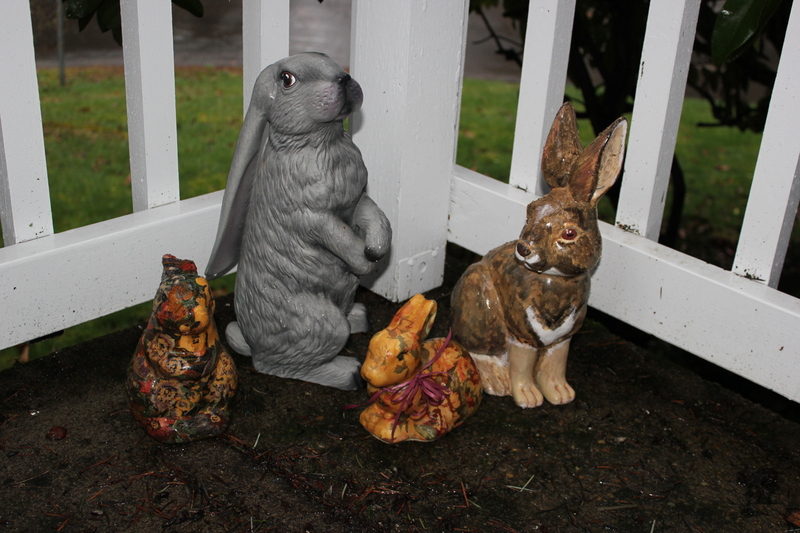 It had to come home to my house to be a part of my Easter decorations. I walked by this several times. It isn’t functional, just decorative. I wondered if I could paint it & hang it on the fence or the shed? 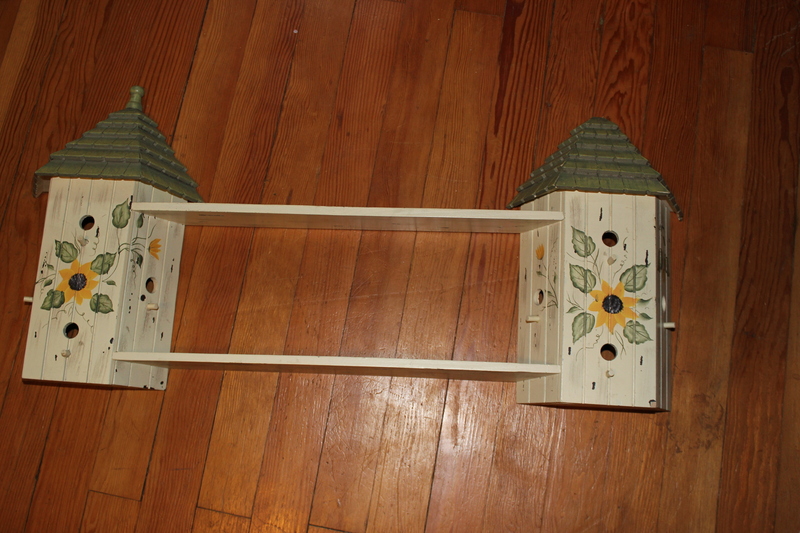 After I brought it home, I wondered if I could take the shelves off. It was brand new and the screws were easy to remove. One house is missing the finial. I want to hang them in tandem, in much the way I photographed them. I don’t think I will repaint them, even. Unrelated, but somehow here in the middle: I also went to World Market/Cost Plus. I found this there. It reminded me of Redwall Abbey and Brian Jacques, the author of Martin the Warrior. I had to purchase it. 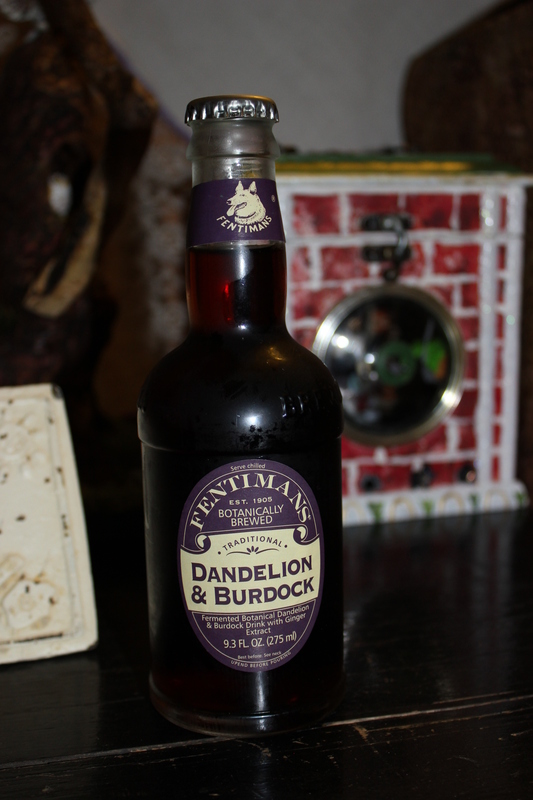 It was really yummy and I felt like a mole stealing a sip in the cellar with the Hedgehog. 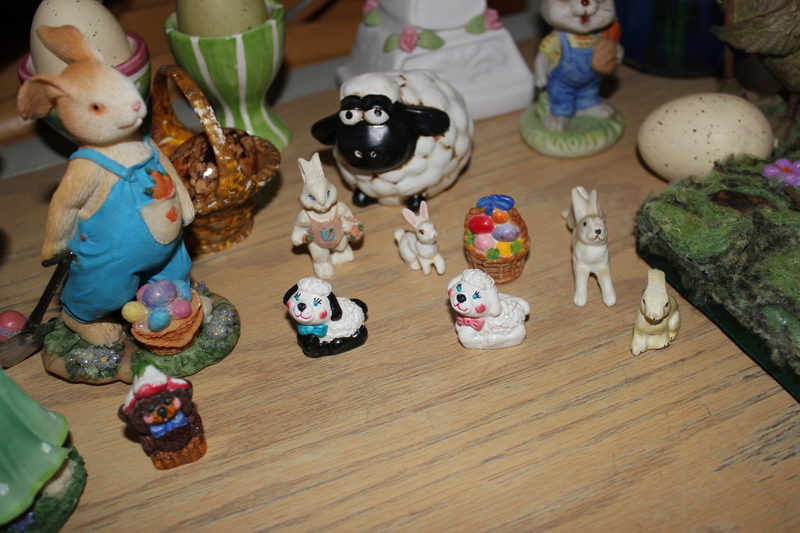 Part Three: because I bought the duck, I was reminded that I needed to pull out the Easter decorations. I won’t bore you with how that entails moving boxes back out of my 12×6’attic in order to find the three boxes that belong to Easter, and then putting everything back into the attic in a different order. I have to put on knee pads and climb in and out of the attic, because it is really just a crawlspace in the loft. It does have a light. It also has a lot of loose insulation. But no spiders. Spiders don’t like the crawl space for some reason. Maybe it’s the loose insulation? P.S. – I added the lavender raincoat to hide the telephone mess behind the baker’s rack. Easter is about hope, new life, resurrection. As we (Christians) have attempted to incorporate Beltane and other spring equinox celebrations, Pagan symbols have slipped into it: eggs and bunnies, for the most part. Lambs have to do with the Christian celebration, but they are also a symbol of renewed life. I have no problem mixing metaphors, and since most Christian holidays are mixed metaphors, that’s probably a good thing. I could never be a purist, throwing the eggs, chicks, bunnies, chocolate, and May Pole out with the Christmas tree, Yule log, and that fat jolly elf from the North Pole. My collection of bunnies has become a family. I decided the grey one is really a lop-eared bunny, not a hare. The feet are wrong for a hare. 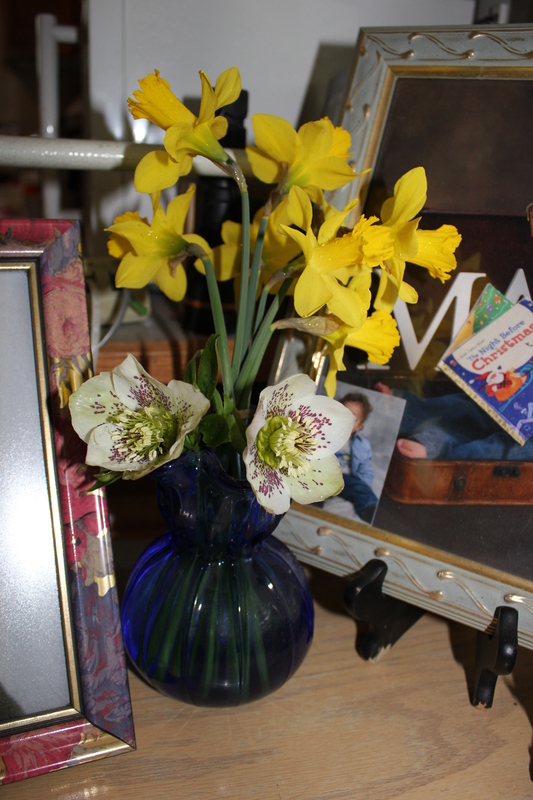 Daffodils and Lenten Roses. I’m beyond excited that my Lenten Rose (the only one that has survived out of three) is large enough that I can cut some blooms and not harm the integrity of the plant – and that it has bloomed in time for Lent. So there I am: test results: healthy. Today’s finds: fun. Tomorrow’s hope: another season of birth, and a season of rebirth. Happy to hear the results. . .Totally am with you on the need to go shopping at Goodwill, I consider it a cure all. Havin’ a sip with the hedgehog! you are being generous I would have kept it all to myself! 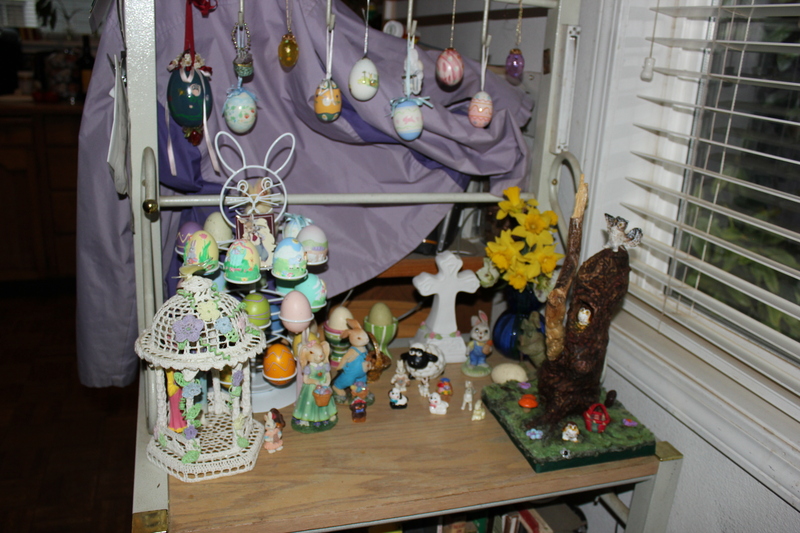 This year I am replacing my Easter village with my fairy village, it has grown, thanks to Germany. I might go back to the easter one NEXT year, but for now I am charmed by my newly acquired fey folk & homes.